1930 United States. Bureau of the Census. 15th census, United States, 1930 federal census : population schedules ; NARA microfilm publication T626, Washington, District of Columbia: Bureau of the Census Micro-Film Laboratory, ([19--?]) , Census Place: Newburyport, Essex, Massachusetts; Roll: 901; Page: 14B; Enumeration District: 222; Image: 568.0; FHL microfilm: 2340636. Sixteenth Census of the United States, 1940, Washington, D.C.: National Archives and Records Administration, (1940) , Census Place: Newburyport, Essex, Massachusetts; Roll: T627_1587; Page: 1A; Enumeration District: 5-291.
living at Turkey Hill Road, Newburyport, Massachusetts. living at 6 Walnut Street, Newburyport, Massachusetts. Massachusetts, Births, 1841-1915," index and images, FamilySearch (https://familysearch.org/pal:/MM9.1.1/FXF2-CR6 : accessed 21 Nov 2012), Henry Bartlett Rundlett, 1904. 1910 United States. Bureau of the Census. 13th census, 1910 population census schedules, Washington, District of Columbia: Bureau of Census Micro-Film Lab, ([19--?]) , Census Place: Newburyport Ward 5, Essex, Massachusetts; Roll: T624_586; Page: 11A; Enumeration District: 0437; ; FHL microfilm: 1374599. 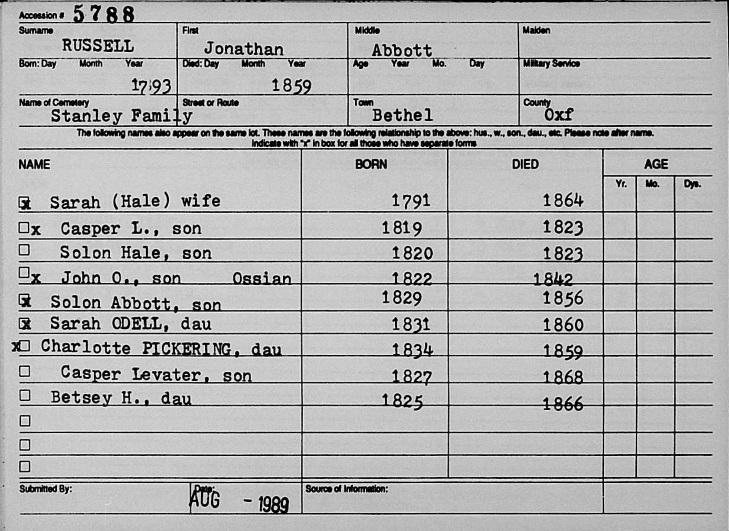 "Massachusetts, Births, 1841-1915," index and images, FamilySearch (https://familysearch.org/pal:/MM9.1.1/FX4P-ZNM : accessed 21 Nov 2012), Estelle L. W. Bartlett in entry for John Cutter Rundlett, 1901. Mary Ann Rundlett was born in September, 1952. 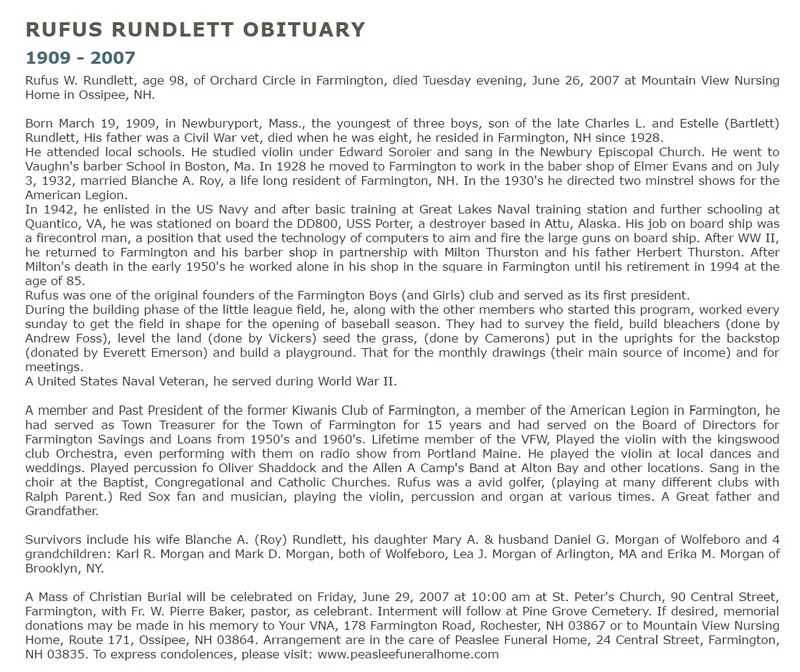 Rufus W. Rundlett was born on March 19, 1909 in Newburyport, Massachusetts. He attended local schools, and studied violin under Edward Soroier and sang in the Newbury Episcopal Church. He went to Vaughn's barber School in Boston. In 1928, he moved to Farmington to work in the barber shop of Elmer Evans. In the 1930's he directed two minstrel shows for the American Legion. In 1942, he enlisted in the US Navy and after basic training at Great Lakes Naval training station and further schooling at Quantico, VA, he was stationed on board the DD800, USS Porter, a destroyer based in Attu, Alaska. His job on board ship was a fire control man, a position that used the technology of computers to aim and fire the large guns on board ship. After WW II, he returned to Farmington and his barber shop in partnership with Milton Thurston and his father, Herbert Thurston. After Milton's death in the early 1950's he worked alone in his shop in the square in Farmington until his retirement in 1994 at the age of 85. 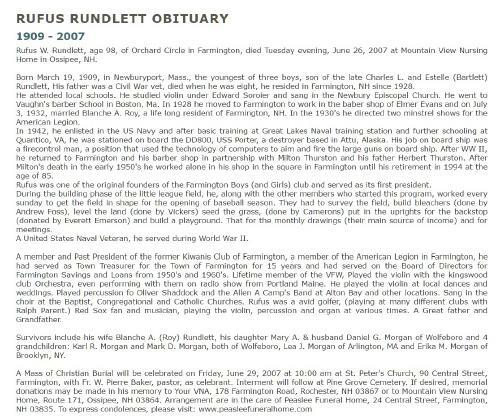 Rufus was one of the original founders of the Farmington Boys (and Girls) club and served as its first president. During the building phase of the little league field, he, along with the other members who started this program, worked every sunday to get the field in shape for the opening of baseball season. They had to survey the field, build bleachers (done by Andrew Foss), level the land (done by Vickers) seed the grass, (done by Camerons) put in the uprights for the backstop (donated by Everett Emerson) and build a playground. That for the monthly drawings (their main source of income) and for meetings. A United States Naval Veteran, he served during World War II. "New Hampshire, Marriage Records, 1637-1947," index and images, FamilySearch (https://familysearch.org/pal:/MM9.1.1/FLZJ-2M9 : accessed 21 Nov 2012), Rufus W. Rundlett and Blanche A. Roy and null, 1932. William Runnels was born perhaps about 1729. Anna died on July 5, 1922 in Waterford, Oxford County, Maine, at age 65. She was buried in Elm Vale Cemetery, Waterford, Oxford County, Maine, Her gravestone reads, "She kept the faith." "Maine Vital Records, 1670-1907 ", database with images, FamilySearch (https://familysearch.org/ark:/61903/1:1:2HKV-SJ6 : 27 December 2014), Henry W Hale and Anna E Russell, 1875. "Maine Vital Records, 1670-1907 ", database with images, FamilySearch (https://familysearch.org/ark:/61903/1:1:2HVZ-8L8 : 27 December 2014), Edward Russell Hale, 1884. Betsey died on May 28, 1866 at age 41. Casper L. Russell was born on March 23, 1819. Casper died on August 6, 1823 at age 4. William Berry Lapham, The History of Norway, Maine, Somersworth, N.H.: New England History Press in collaboration with the Norway Historical Society, (1986) , p. 607-8. "Massachusetts Marriages, 1695-1910," database, FamilySearch (https://familysearch.org/ark:/61903/1:1:FHG5-4ZC : accessed 31 March 2016), C. L. Russell and Ellen M. Richardson, 30 Oct 1860; citing reference Pg. 25 No. 28; FHL microfilm 1,887,442. Daniel Russell was born perhaps about 1729. "Massachusetts Marriages, 1695-1910," database, FamilySearch (https://familysearch.org/ark:/61903/1:1:FH8B-6LD : 4 December 2014), John Russell and Julia A. Hovey Cushman, 06 Sep 1860; citing reference ; FHL microfilm 818,082. John Ossian Russell was born on October 10, 1822. John died on December 24, 1842 at age 20. 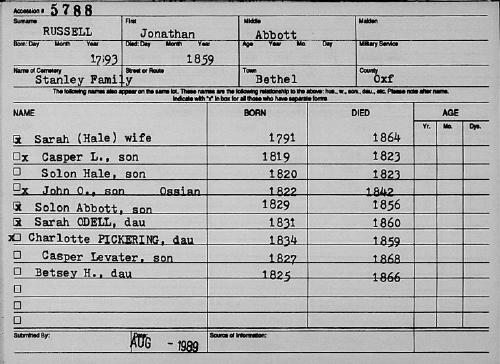 "Maine Births and Christenings, 1739-1900," database, FamilySearch (https://familysearch.org/ark:/61903/1:1:F43N-JHN : 4 December 2014), Jonathon Abbot Russell, 12 Jun 1793; citing CIVIL, BETHEL, OXFORD, MAINE; FHL microfilm 10,606.
living at Woodstock, Grafton County, New Hampshire. William B. Lapham, History of Bethel: formerly Sudbury, Canada, Oxford County, Maine, 1768-1890; with a brief sketch of Hanover and family statistics, , at https://books.google.com/books?id=4vUgAQAAMAAJ . Augusta, Me. : Press of the Maine Farmer, (1891) , p. 607-8. Solon died on December 24, 1856 at age 27. Solon Hale Russell was born on November 3, 1820. Solon died on August 1, 1823 at age 2.